I’ve been on a bit of a berry kick lately, and unfortunately, my eyes were bigger than my berry hungry stomach. Get it!? Of course, the best price for berries is Costco, where you get a crap-ton (yes, it’s a scientific measurement) for the same price your local grocery sells those teeny tiny cartons. So, while it’s a better bang for your buck, it’s quite a bit of berries to eat for two people. Not to mention that I eat mostly blueberries – what we have the most of – and Nate exclusively eats raspberries (which, yes, I prefer, but are SO much more expensive). We were heading out of town for the 4th of July weekend, so I knew if we didn’t eat them up, they’d go bad. 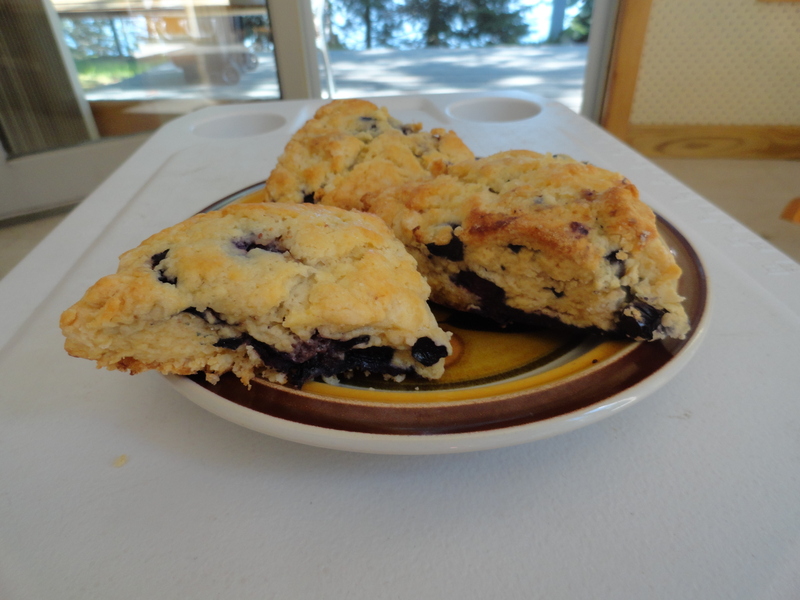 I decided to make something we could take with us for the weekend, so I whipped up these beautiful blueberry scones. I may or may not (mostly may) have been making a handful of other things at the same time, so I overlooked the fact that there is lemon zest in these. Whoops! They still taste awesome, but I wished I remembered because they would have had just a little more pop! 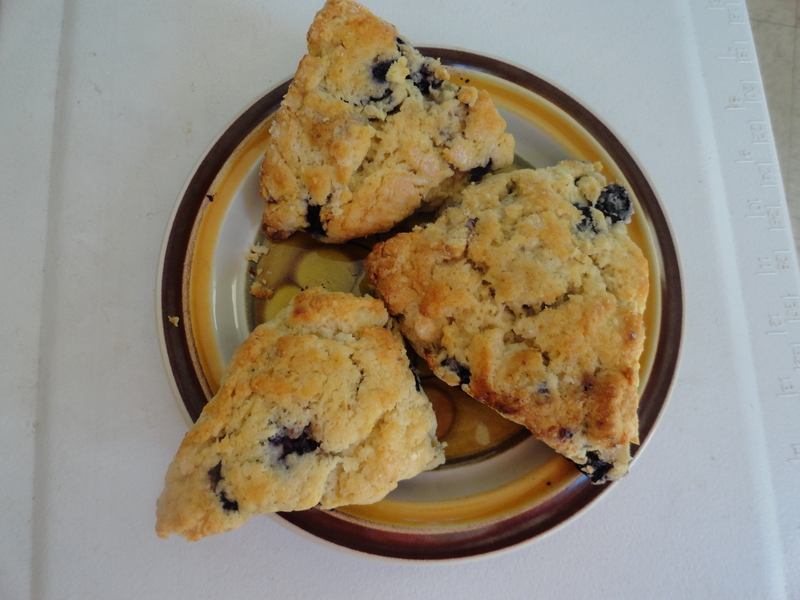 The scones are flakey and light, and not too sweet. 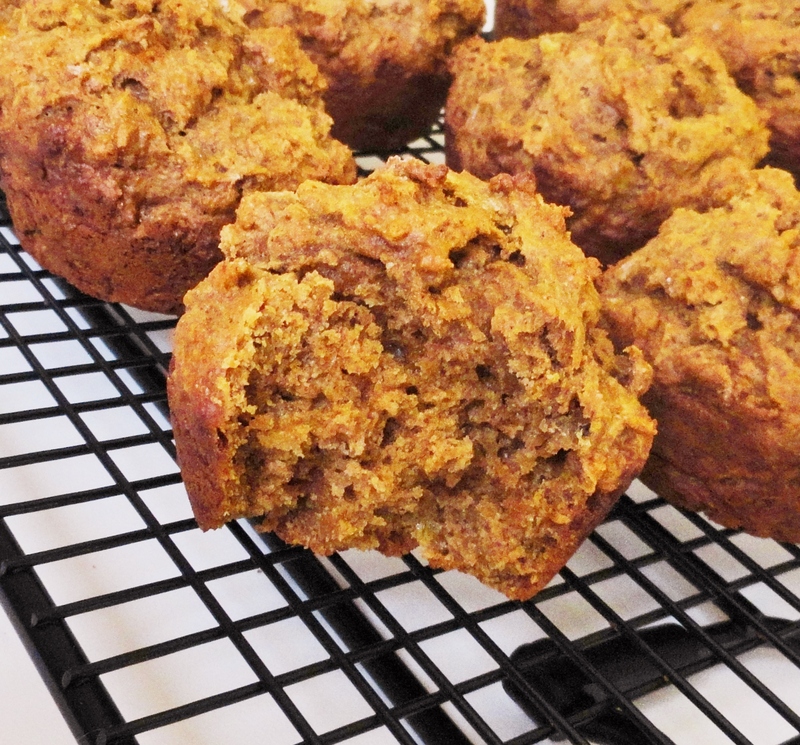 A perfect little breakfast snack – a great idea to bring to share at work or any brunch gathering! 1. Preheat oven to 400 degrees. Line a baking sheet with parchment paper and set aside. 2. In the bowl of a food processor, pulse together flour, 3 tbsp. sugar, baking powder and salt. Add butter and pulse until the largest pieces are the size of peas. Transfer to mixing bowl and stir in blueberries and zest. 3. 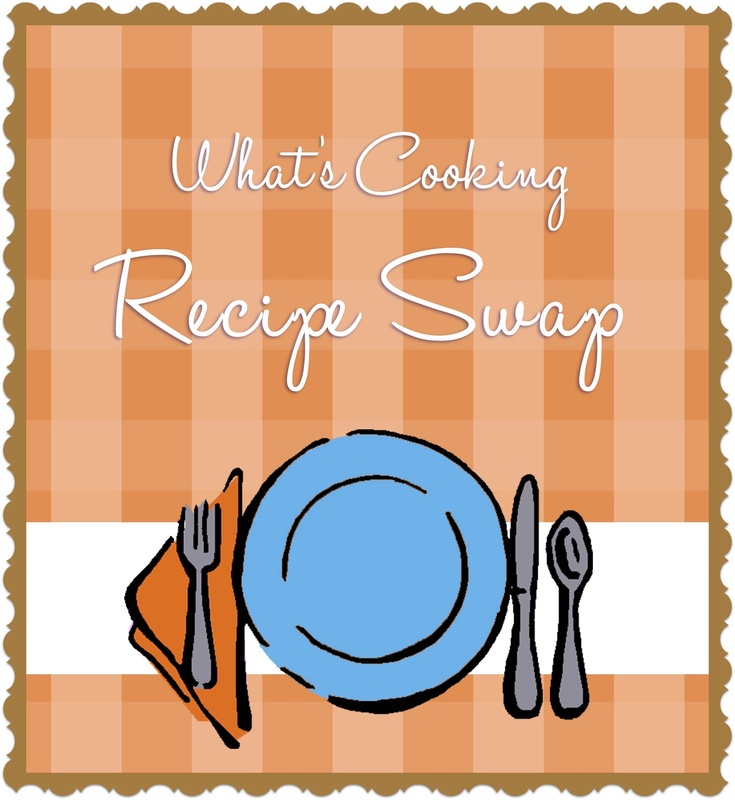 In a liquid measuring cup, whisk together heavy cream and eggs. Make a well in the center of the flour mixture and pour in egg mixture. Lightly stir with fork until dough just comes together. Turn out onto a lightly floured surface, and knead a few times to mix well. 4. Pat dough into a 6-inch square about 1 1/4 inches thick. Using a floured knife, cut into four 3-inch squares, then cut squares in half on the diagonal to form eight triangles. Transfer to prepared baking sheet, brush tops with heavy cream and sprinkle with sugar. Bake for 20-22 minutes, until golden brown. Transfer to wire rack to cool. A few days ago, I got a wax and facial from my girlfriend who is an esthetician. It was awesome. Even better, we drank wine, before, during (mostly me during) and after. She offered me some snacks after, one being a lemon poppy seed scone. I’m not typically a pastry person – and it’s definitely not because I don’t like them, but because they are sooo sooo not very good for you. I like to use up my calories in wine 😛 Anyway, I did have one, and it made me really want to make them. 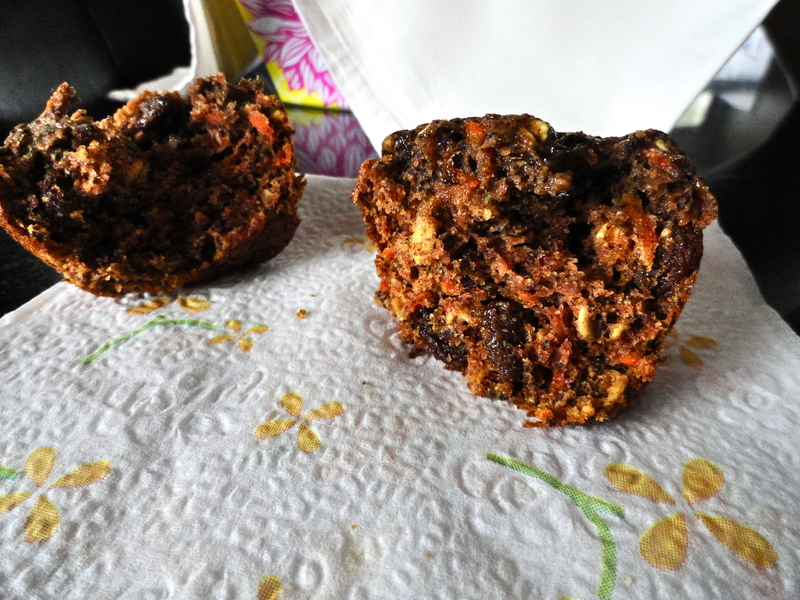 Clearly, you can see I didn’t make scones, rather muffins. I thought this would be a slightly healthier option, with a little less butter. 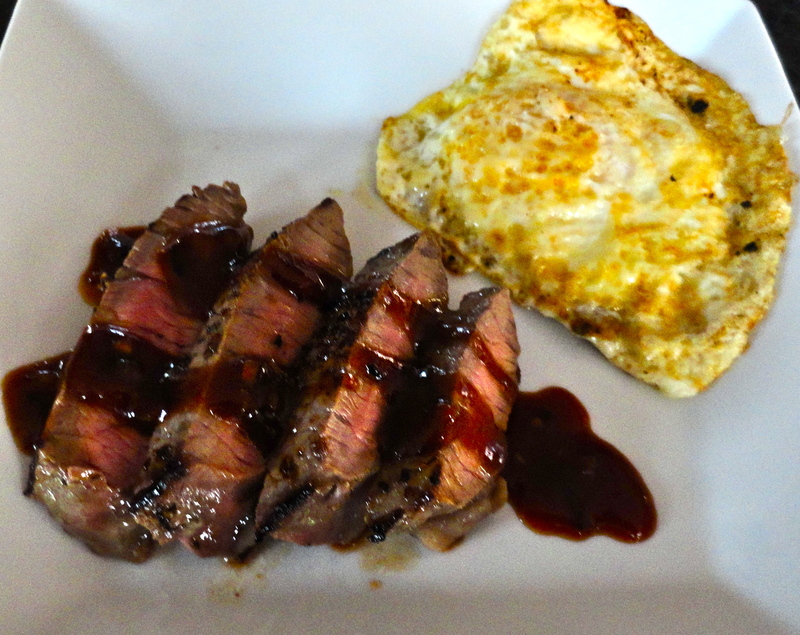 I also substituted apple sauce and extra baking powder for eggs. 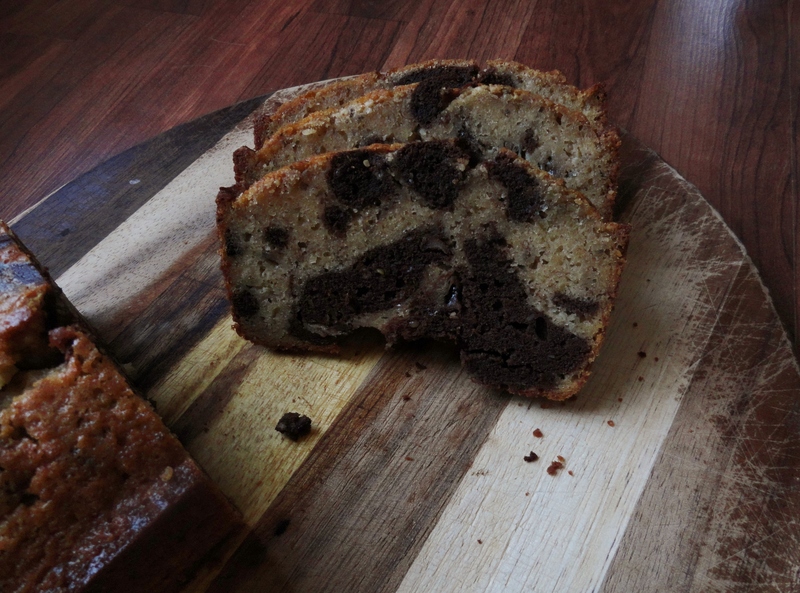 But, you really can’t hide that full stick of butter in the batter. Oh well, we must indulge every now and then. 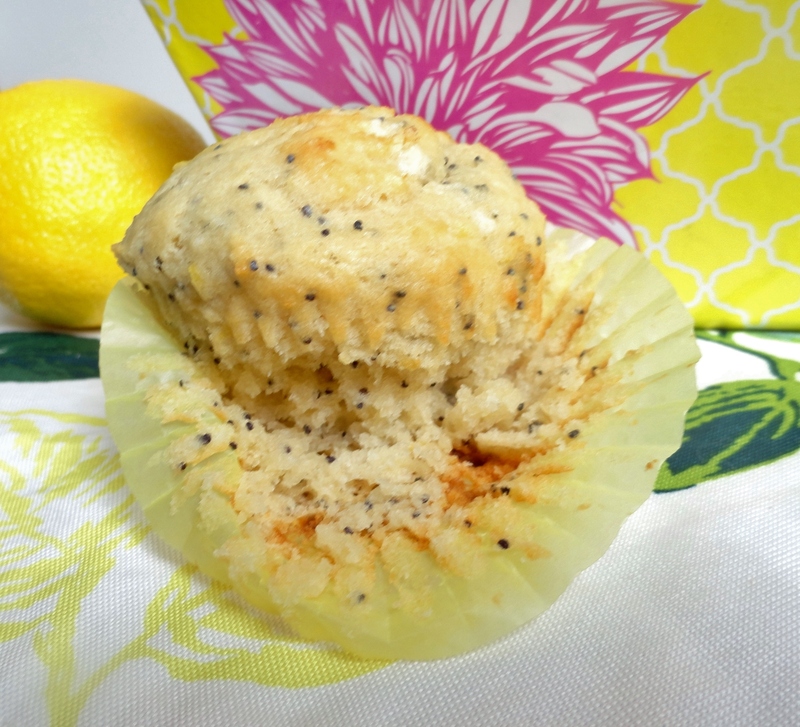 I think I’ll try out the lemon poppy seed scones next time. My pumpkin scones turned out so well, it’d be too hard not too. 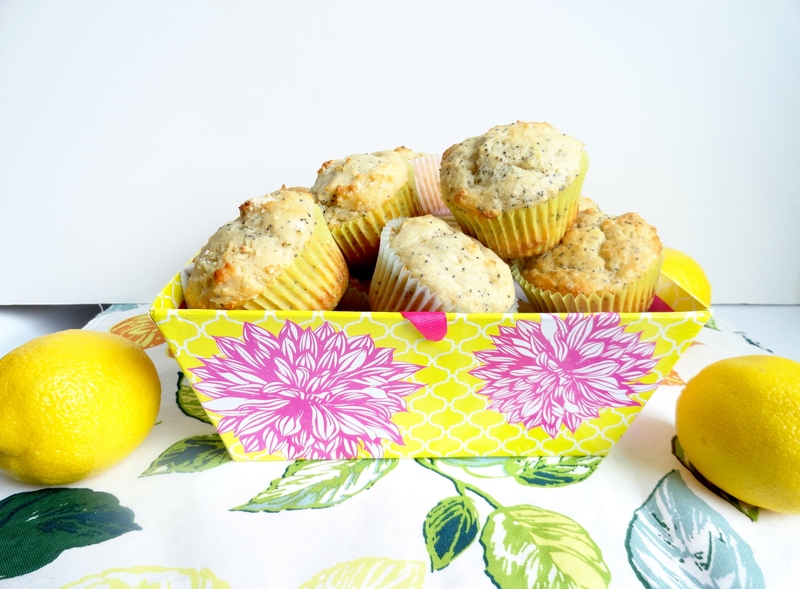 The lemon zest and juice keep these light and fluffy muffins tasting bright and fresh. 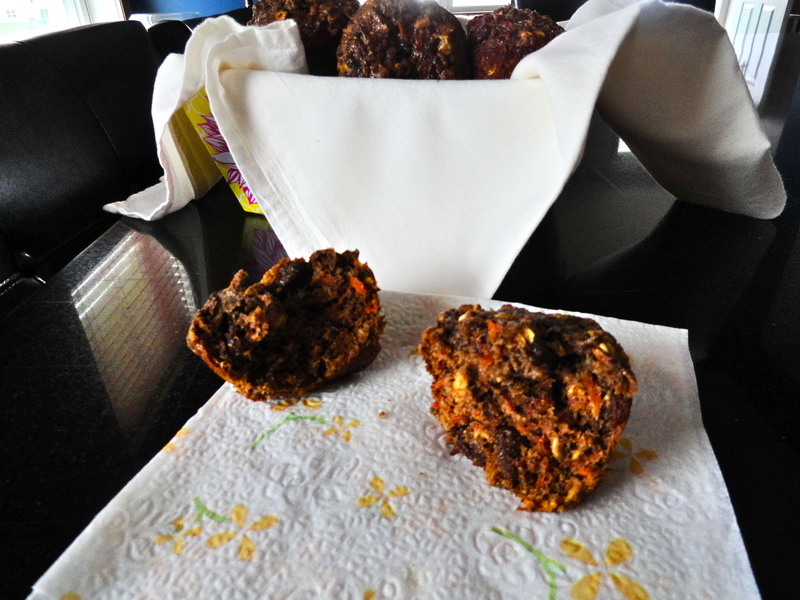 Nate has taken one to work most days for breakfast; I think they are perfect for on the go, snacks or breakfasts! 1. Preheat oven to 400 degrees. 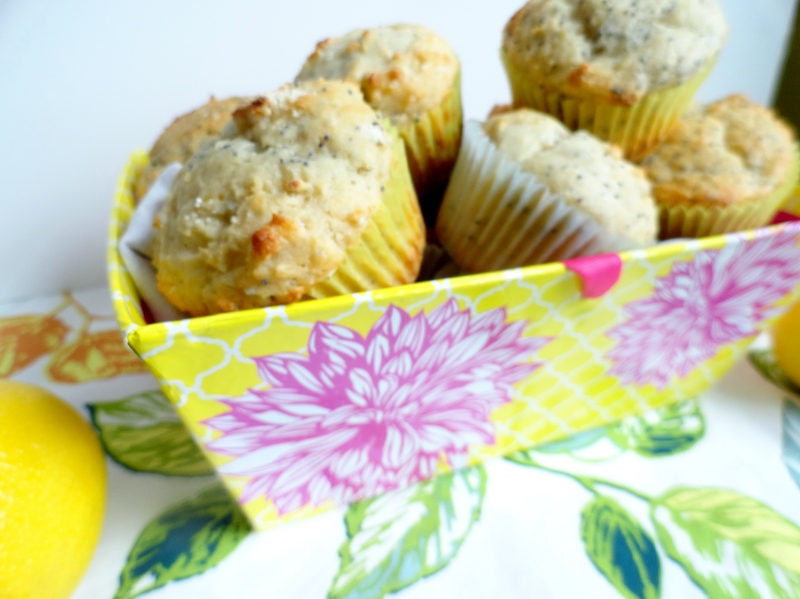 Spray muffin tin with oil or place paper muffin cups in molds. 2. In a large bowl, rub sugar and lemon zest together with fingertips until fragrant and sugar is moist. Whisk in flour, baking powder, baking soda and salt. In another large bowl, whisk together lemon juice, Greek yogurt, eggs, vanilla and butter until well blended. 3. Pour liquid ingredients into dry ingredients and gently stir to blend, careful not to over-mix. Fold in poppy seeds. 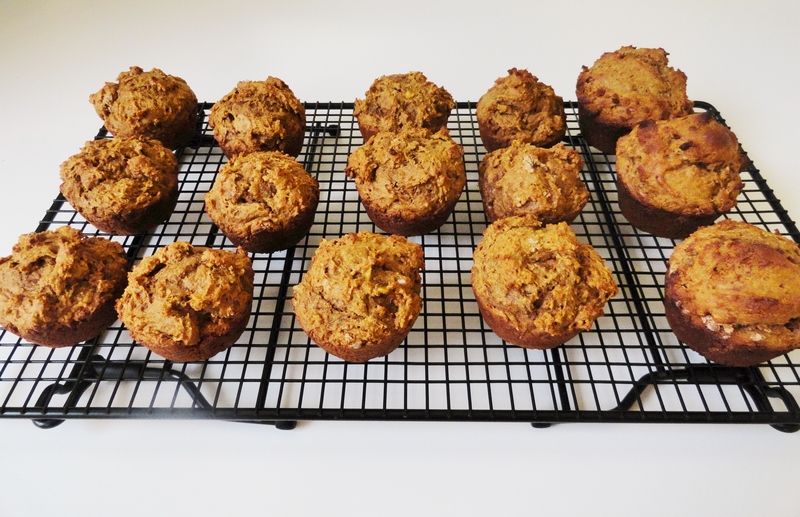 Divide batter evenly into muffin tins (I made smaller muffins, not in a mini muffin tin, so they were more reasonably portioned, so it ended up making 18 medium muffins instead of 12 large). *If you like them just a bit sweeter, sprinkle some coarse sugar over the top of the divided batter. 4. 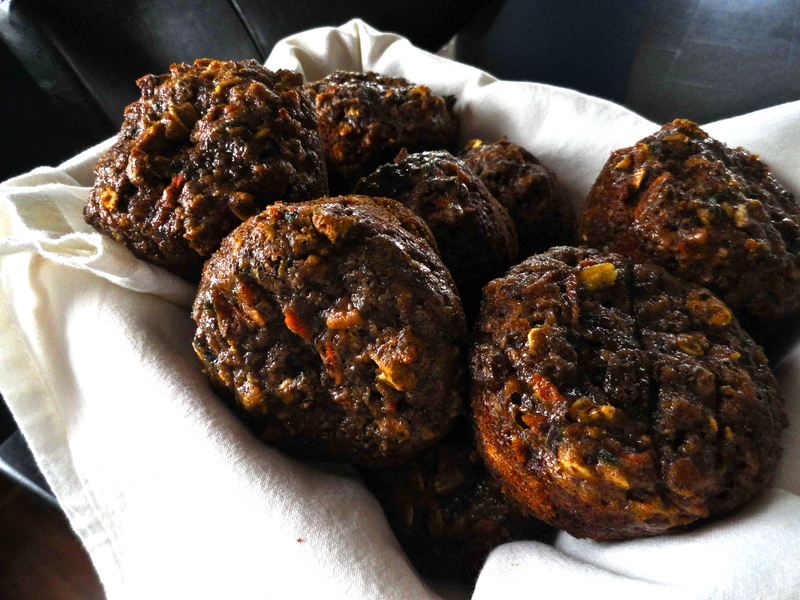 Bake for 18-20 minutes, or until tops are golden and a toothpick inserted into the center of a muffin comes out clean. Remove from oven and let cool on wire rack before removing from pan. I have really been putting these off because I knew how time-consuming they would be. But, I’m really running out of time to get my 30 Before 30 list done, so I had to bite the bullet and go for it. It was actually a good weekend to make these because it was slightly chilly, and ridiculously windy. I was home alone on Friday night, and whilst making enchilada sauce, cilantro pesto and prepping my veggies for the week, I thought it’d be a good idea to start the dough for the croissants. I’d just spent the afternoon at my parents house, relaxing by the fire with a cocktail, and then stopped at the grocery store on the way home. I got in my comfies, cleaned up the kitchen (of course only so I could get it dirty again), and opened up Baking with Julia to start the croissant dough. 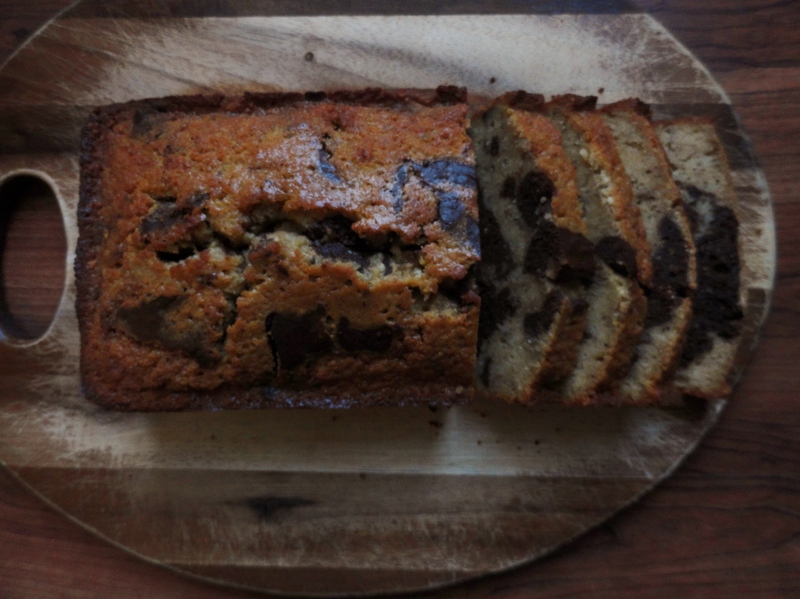 Like a good girl, I had already read through the entire recipe (and it’s LONG), so I knew what to expect. I knew I could let the dough do its second rise overnight in the fridge, so I wanted to get to that point. Well, guess what? I didn’t get any compressed yeast at the store, which was the first GD thing on the ingredient list. Seeing as though I was already in my comfies and had a glass of wine poured, I decided not to go to the store again. Plus, I wasn’t even sure my store would carry compressed yeast (I’ve never bought it before), so I didn’t want to take the chance of running out to grab some, and coming back empty-handed. What a waste of time. 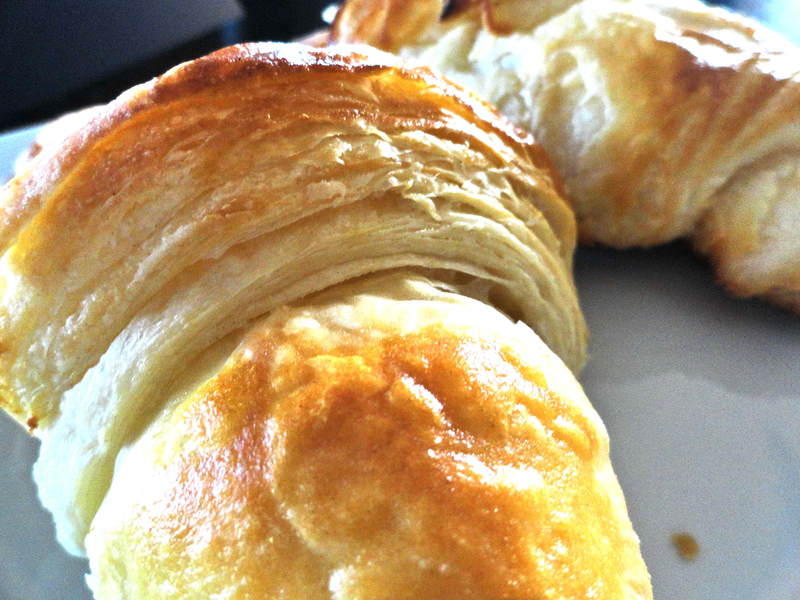 Instead, I Googled a recipe for croissants using dry active yeast seeing as though that was what I had on hand. First recipe to come up: Martha Stewart’s. 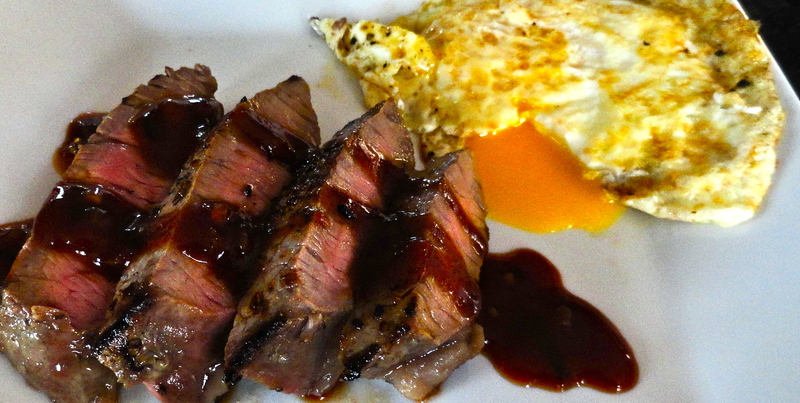 Now, she may be a thieving felon, but damn, that woman knows her way around a kitchen…and a home. I would absolutely love to live with her for a week. Okay, a month. Minimum. Though I know Momma Marsha was counting on me to make Julia Child’s croissant recipe (from the cookbook I borrowed from her), I went with Martha’s, purely for convenience. Convenience is the farthest thing from making croissants, which I knew going into this from Momma Marsha. While making them, I thought, I don’t think I would ever make them again unless I wanted to punish myself. I didn’t at all think it was hard, but it really is time-consuming. I started the dough on Friday night and finished late late on Saturday night.Everything seemed to be going swimmingly, until I got to the baking part. 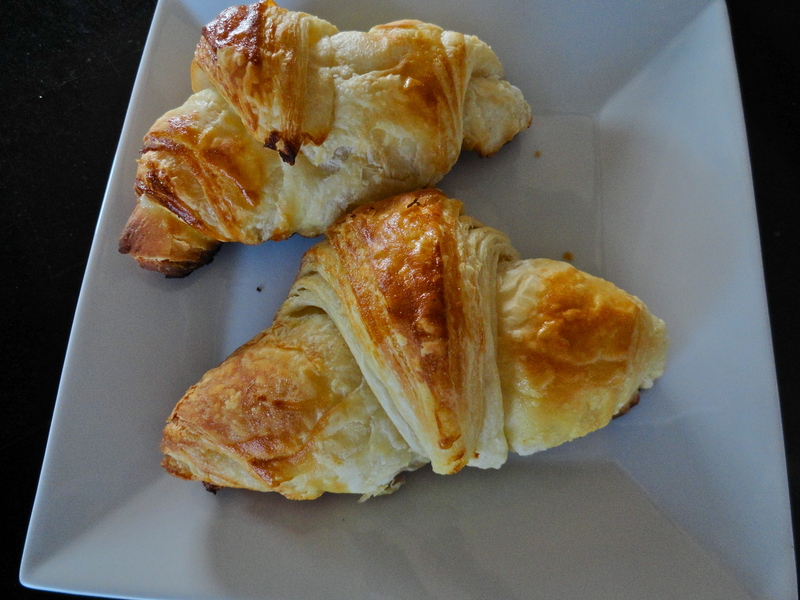 The bottoms of the croissants completely burned. The tops looked pretty, tasted buttery and were ultra flakey, but the bottoms were far from elegant. I’m thinking maybe I let them rise in too warm of a place and the butter melted before putting them in the oven. That being said, I might attempt these one more time (not any time soon) so I can get a better result. 1. In a liquid measuring cup, combine water, yeast and 1 tsp sugar. Allow to proof for 5 minutes. In another measuring cup, combine remaining 2 tsp sugar, salt and warm milk. 2. In a large bowl, whisk the flour. Add yeast mixture, milk mixture and oil. Blend everything together by cutting and pressing with a rubber spatula, incorporating all flour. The dough will be wet. 3. On a well floured work surface, turn the dough out and let rest for 3 minutes to allow the flour to absorb some of the liquid. Start kneading by lifting edges and flipping over onto the other side. Continue movement, turning from one side to the other, end over end until dough is smooth and draws back to shape when pressed out, about 8-10 times. Do not over-knead. 4. Transfer dough to clean bowl. Cover and let rise in a warm place until doubled in size, about 1 1/2 hours. Punch down and turn out onto lightly floured work surface. Using floured hands, push dough into 12-inch by 10-inch rectangle. Fold dough in three, like a business letter, and transfer to a lightly floured baking sheet or plate. Cover with plastic wrap and set in warm place to rise until doubled in size, about 45 minutes. You could also let it rise overnight in the fridge. 5. Punch down the dough, cover with plastic, and return to refrigerator for 20 minutes. This will allow the gluten to relax, making it easier to roll out. 6. Place butter on a lightly floured work surface and beat with rolling-pin to soften. Smear butter out with the heel of your hand so it’s spreadable consistency, but still cold. Refrigerate if it becomes soft and oily. 7. 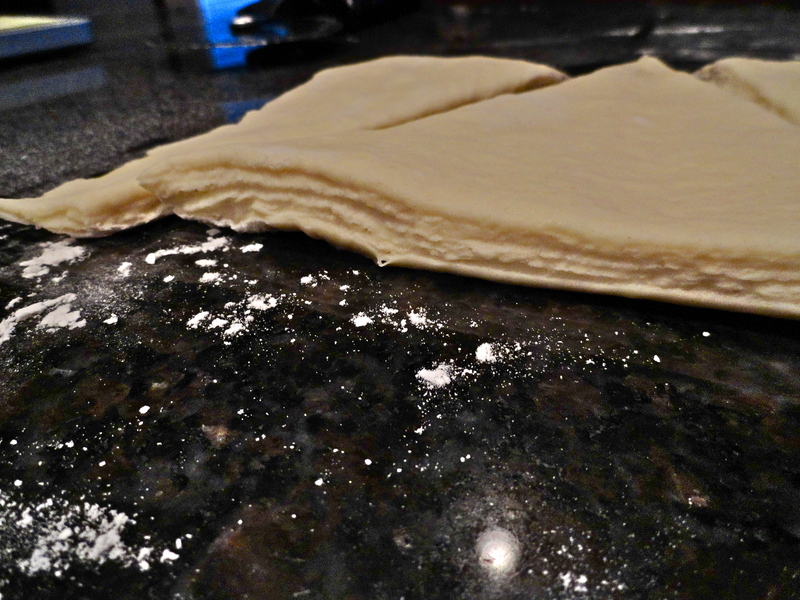 Place dough on a lightly floured work surface and roll out into 18 by 10-inch rectangle. Facing the rectangle, lengthwise, spread the butter as evenly as possible on the upper two-thirds of the rectangle, leaving a 1/4 inch border. Fold the bottom, unbuttered, third of the dough up to the middle. Fold top third down to cover it. 8. Lightly flour the top of the dough and the work surface. Turn the dough so the edge of the top flap is to your right. Roll dough out into 18 by 8-inch rectangle. Move quickly, starting within one inch of the end near you moving to within one inch of the far end. Fold dough in thirds as before. Wrap in plastic and return to fridge for 1 hour. 9. Remove dough from refrigerator and sprinkle with flour and deflate dough by tapping lightly with rolling-pin. Cover with plastic wrap and let rest for 8 minutes, to relax gluten, if necessary. Repeat rolling and folding process, as above, twice more. If butter has hardened and congealed into flakes, beat the dough with light firm taps, from one side to the other, until butter has softened. It must be able to stretch the length of the dough and width of the rectangle inside the dough as your roll it out until it has softened. Cover with plastic wrap and refrigerate for 2 hours, or overnight. 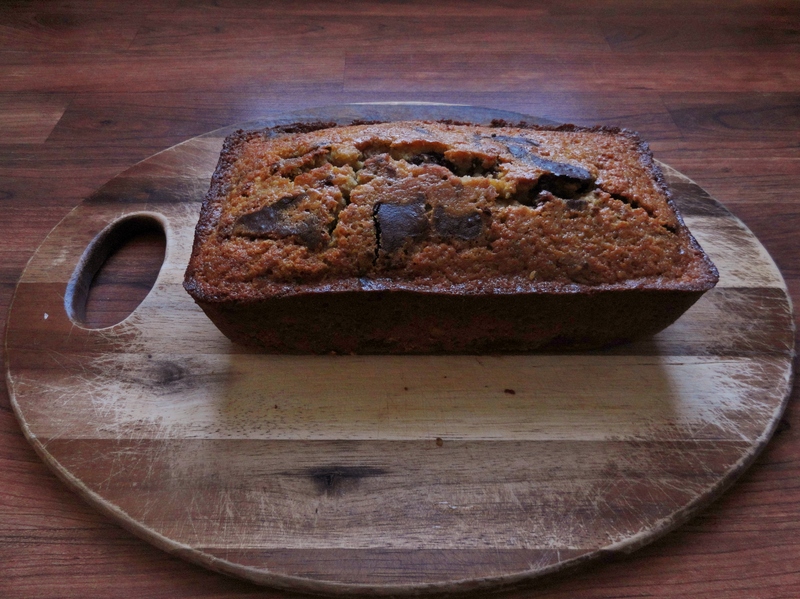 If refrigerating overnight, cover with board and 5 pound weight. Resting overnight will facilitate shaping. 10. Place chilled dough on lightly floured surface. Deflate dough. Roll dough out to 25 by 12-inch rectangle. Cut in half, lengthwise. Return one half of the dough to the refrigerator. Cut the other half into triangles with a 5-inch base. One half should make about 8 triangles. 11. Roll the triangles out to enlarge slightly. Roll toward the tip, creating tension by using your other hand to stretch the top of the triangle away from you. The dough should overlap 3 times, with the tip sticking out from underneath. 12. Place on parchment paper lined baking sheet, about 2-inches apart, curving inward, creating a crescent shape. Cover with lightly with plastic. Repeat with second piece of dough. Let stand in a warm place very spongy and doubled in size, about 1 to 1 1/2 hours. 13. Preheat oven to 475 degrees. In a small bowl, whisk together egg yolk and heavy cream. 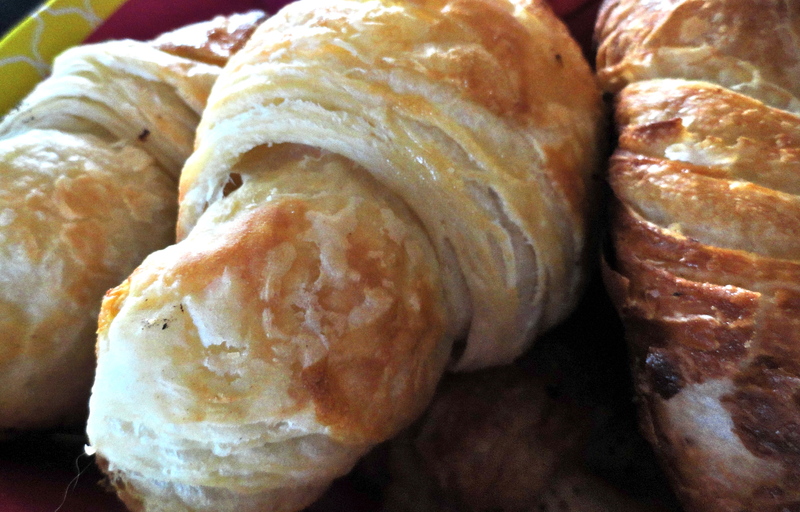 Lightly brush over the tops of the croissants. Open oven door and spritz heavily with water from a spray bottle and quickly close the door. 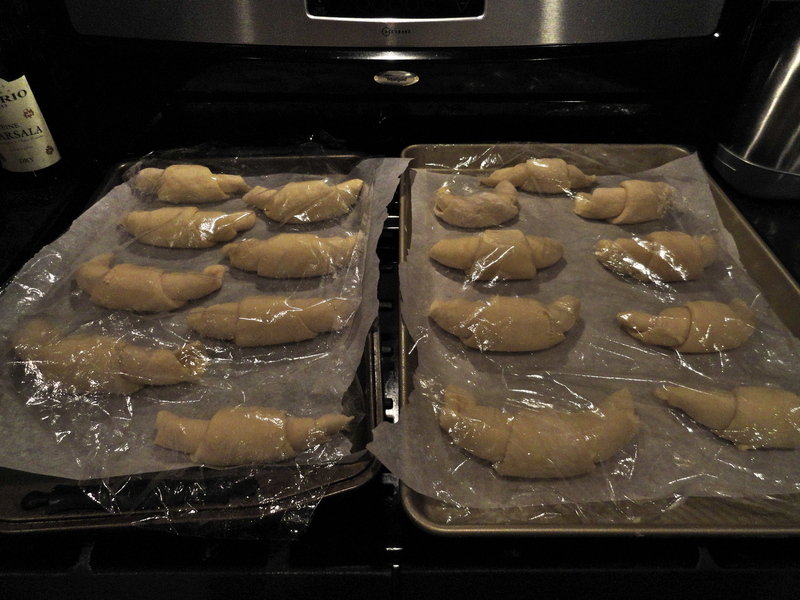 Place croissants in oven and spray the bottom of the oven with water once more. Bake until puffed and golden brown, about 15 minutes, turning after 10 minutes to ensure even baking. Reduce oven temperature to 400 degrees and continue to bake until cooked through, about 5 more minutes. Transfer to wire rack and cool for 15 minutes before serving.